Rothwell & Towler was set up in 1973 and operates specialist insurance brands; World First Travel Insurance, Guest First, Hotelsure, Cancelsure and Visitorsure. Over the past four years the company has seen turnover increase from £550k to a predicted £3.5m in 2012, hence the need to increase staffing levels. The two new team members, Malcolm Whittle and Sophie Williams have been appointed to help to develop the customer services team, enable it to operate for longer hours and manage increasing call volumes across a range of travel insurance products and services. And there should be more to follow; there are plans to recruit more team members during the next six months with a view to increasing the number of customer service advisers to 18 by the summer. Martin Rothwell, Managing Partner of Rothwell & Towler, says, "We've secured some great new talent in Malcolm and Sophie, both with a very solid background in customer service. 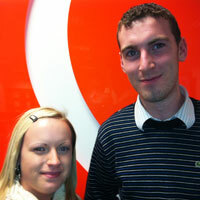 They join a bright and enthusiastic team, dedicated to providing the very best customer experience possible. They also really enjoy and have a lot of experience of travelling, which really helps them to understand and meet our customers' needs." Malcolm Whittle has A levels in Law and World Development and experience in customer service spanning the public and private sectors. Combining work and travel Malcolm worked in customer services in Sydney, Australia for nearly a year. Malcolm says, "Im really looking forward to working at Rothwell & Towler. It's a really exciting time to come on board as they recently moved in to new offices and have got the latest IT and telecommunications software to help us give great customer service." Sophie Williams, has an NVQ in Leisure and Tourism and has worked for Liverpool Victoria Insurance for the past five years. Working as a customer services representative Sophie has developed skills and experience in the financial and insurance services industry which can be transferred to her new role at Rothwell & Towler. Sophie says "The opportunity to work with an independent, family fun business with more than 35 years' experience in the industry was too good to miss. I'm thrilled to be joining such a vibrant team of people at a time when the business is going form strength to strength. Rothwell & Towler appear to be very different to many of the insurance companies that have sprung up in the last ten years and I am looking forward to taking on new challenges and working for a travel insurance specialist." Rothwell & Towler's leading insurance brand is World First Travel Insurance. World First has become one of the UK's leading providers of travel insurance for people with medical problems alongside covering everything else from cruises to winter sports ski and snowboard holidays, as well as the traditional summer breaks. Rothwell & Towler is authorised and regulated by the Financial Services Authority.